A company here in Silicon Valley has created a device to help people drive as efficiently as possible. The device plugs into a port on your steering wheel and then provides all kinds of useful information about your driving—far more than just the average MPG that many cars calculate on the dashboard. They say efficient driving can improve your MPG by up to 33%. The PLX Kiwi not only displays your MPG, but it also displays how many gallons of gas you use. It keeps track of how dollars of gas you spend and SAVE. For example, if your commute from home to work is 20 miles, and you get on average 20 MPG, you use exactly 1 gallon of gas. If the gas price is $4/gallon, you’ve used $4 of gas to drive to work. After using Kiwi, with a 20% improvement, you’ll notice your MPG rise from 20 to 24. With the same 20 mile trip, you’ll only spend $3.33 in gas saving you 66 cents per trip. Trip distances, gasoline used, dollars used and dollars saved are all displayed on Kiwi screen. The Kiwi installs into any 1996 and up vehicle, including hybrids, in a matter of seconds. Kiwi is a plug and play device which interfaces with your existing OBDII port, often located under your steering wheel. By driving with Kiwi, users will be equipped with the knowledge of how to “drive green” and optimize the efficiency of your vehicle simply by modifying your driving behavior in a fun game-like manner. The Kiwi is about the size of an average cellular phone and is equipped with a brilliant 2.2” color organic LED display designed to mount near the vehicle’s dash in a similar fashion to a portable GPS device. 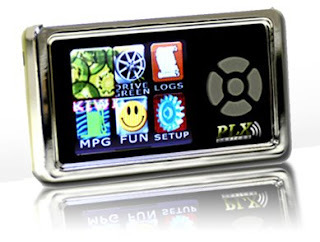 The PLX Kiwi will begin shipping in June 2008 for a suggested retail price of $299 (US). Right now you can buy it direct from the company via their website. I would love to try and drive with the Kiwi. I have no doubt that it would help me improve my driving. However, the price is a little high for me right now. I realize that gas is climbing higher and higher and the device may well pay for itself in half a year or so. It seems a little pricey, but then again, at this rate $300 is probably buying me only 4 tanks of gas. Yikes! It looks like a great bit of kit to help you drive efficiently but I worry that people will be distracted by it. Ultimately, saving gas isn't as important as keeping your eyes on the road.